Not only can the presence of yeast and mold compromise your product but they sometimes also make people sick. So, how do we control unwanted yeast and mold when it comes to our food supply? Obviously, industry innovations targeted at inhibiting yeast and mold growth have done a great deal for quality assurance and producers’ bottom lines. Yet, peace of mind might be much more difficult to come by than a piece of moldy food in your operation. Even with such preventative measures in place, yeast and mold still cause issues and are wont to show up anywhere at any time. This provides a great deal of frustration to food producers, as their equipment, the facility, and the foods produced are all susceptible. Consumers, naturally, can grow weary when yeast and mold compromise their latest purchase at the supermarket. Thankfully, the industry continues to research methods to minimize the waste and possible ill health effects generated by yeast and mold issues. For example, 3M recently introduced a new line of defense in this battle against yeast and mold: 3M™ Petrifilm™ Rapid Yeast and Mold Count Plates. Instead of waiting on traditional agar methods, which may take up to five days to incubate, the new Rapid Yeast and Mold Count Plates provide results in 48-hours, allowing for more oversight of incoming ingredients and finished products leaving food facilities. 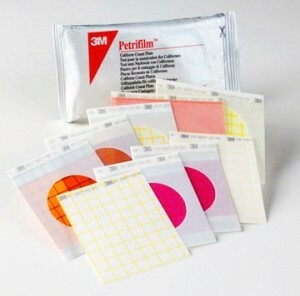 You can check out 3M’s Petrifilm™ Rapid Yeast and Mold Count Plates in 50-count boxes here or 500-count cases here. Nelson-Jameson is continuously searching out new methods and products, like the 3M Petrifilm™ Rapid Yeast and Mold Count Plates, to ensure food safety and integrity. Keep checking back here for more updates on food safety and quality issues, including a host of innovative solutions that target food quality and safety concerns.